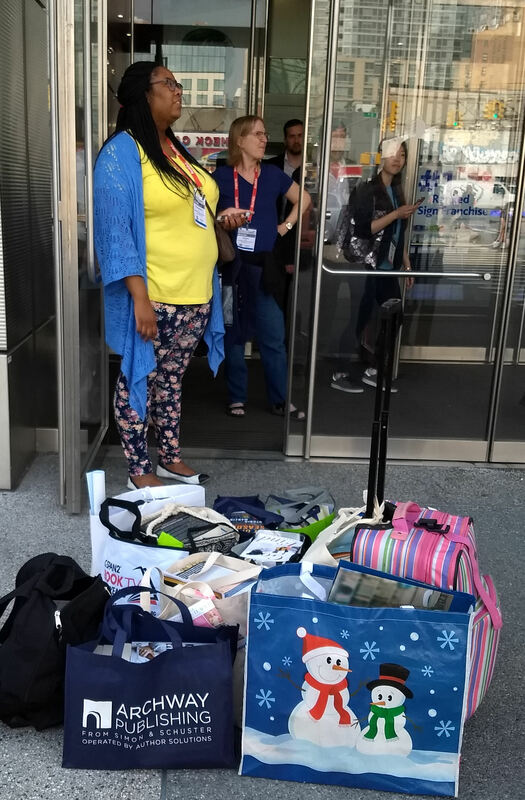 The population of my Montana home town is around 25,000—about the same number of people I encountered during six days at Book Expo America (BEA) and BookCon in New York City. 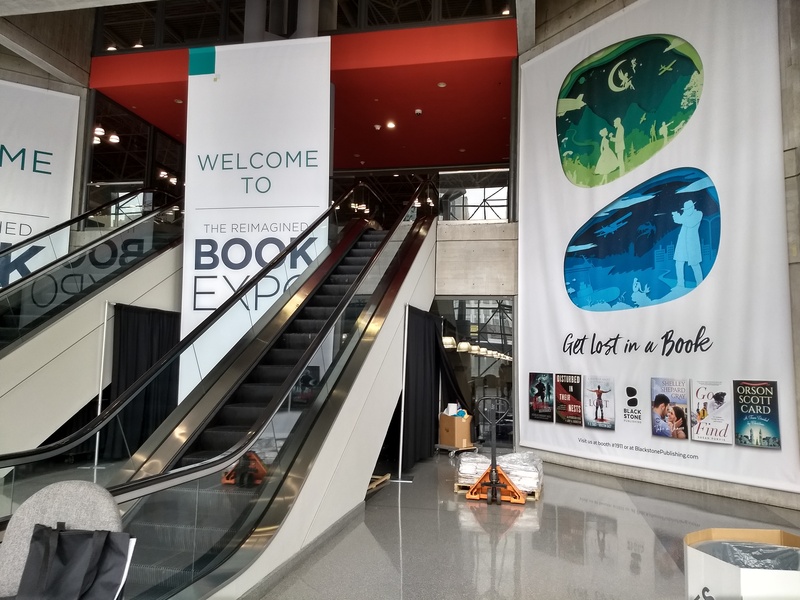 BEA is the biggest annual convention of book publishers, booksellers, distributors, librarians, and authors in North America. 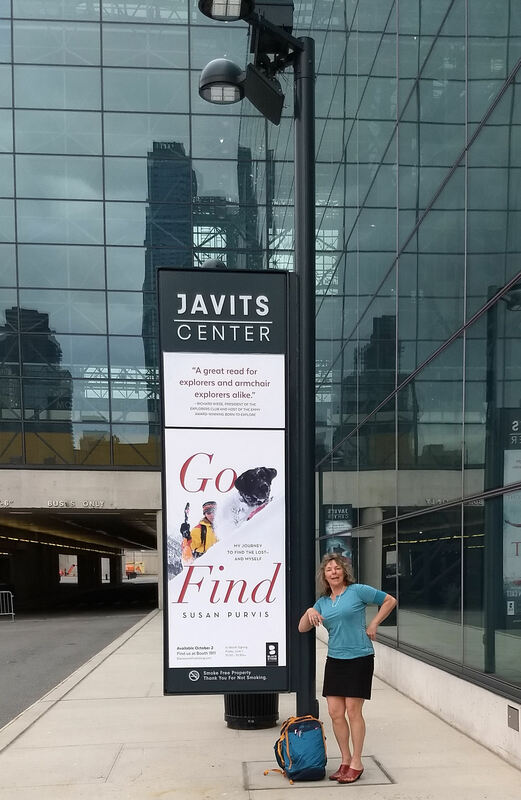 With 840,000 square feet of exhibit space at the Javits Center and nearly 500 exhibitors, the show is so big that Publishers Weekly covers it with daily tabloid reports of 70-100 pages each. The event is open to industry professionals, not the public. I was fortunate to be invited to check out the inner workings of the business. What a learning experience it was! Big names draw big crowds. Celebrities launching new books stayed busy autographing advance reading copies (ARCs). Some wait lines rivaled Splash Mountain at Disney World. This year’s stars included a couple of guys named Patterson and Clinton who co-wrote a thriller, along with Nicholas Sparks, Sally Field, Barbara Kingsolver, Trevor Noah, and more. 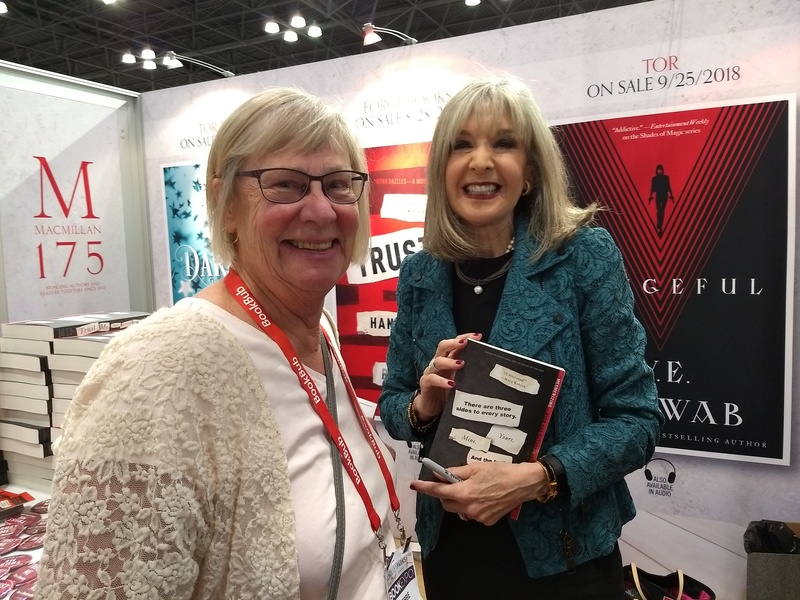 I was delighted to meet the charming Hank Phillippi Ryan at the signing of her new book Trust Me. A few weeks before, I’d watched Hank teach a great online class sponsored by International Thriller Writers (TKZ’s own James Scott Bell also taught a segment of the webinar). 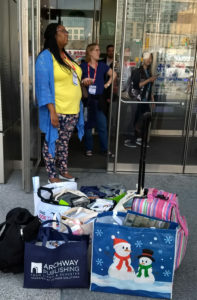 Librarians from all over the country flock to BEA to pick up bagfuls of free ARCs to help them decide what to order for the coming year. Their biggest expense must be the charge for overweight checked baggage! Important lesson to authors: librarians are your best friends. If librarians get behind your book, their efficient network can put millions of eyes on your work. Not surprisingly, Amazon isn’t exactly the most popular kid on the BEA playground. The headline of one daily report read: “Amazon’s Actions Remain a Problem,” a quote by the CEO of the American Booksellers Association. The article talked about the impact of “lost jobs, stores, and uncollected taxes” due to the online giant. The Big Five (Hachette, HarperCollins, Macmillan, Penguin Random House, Simon & Schuster) had large showy booths on main aisles. In contrast, Amazon’s booth was in a distant corner, far from the entrance. 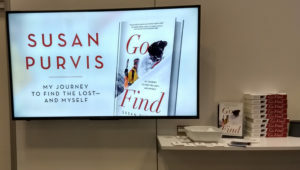 Since Amazon’s Kindle Press had published my thriller Instrument of the Devil, I trekked all the way to the rear of the exhibit hall to visit them. But when I got there…..
Black curtains surrounded all four sides of the booth. Through the gauzy fabric, I could see people moving inside. But there was no entrance. Upon further investigation, I was told Amazon specifically requests a private booth for book publicists to meet with major media to pitch upcoming titles. 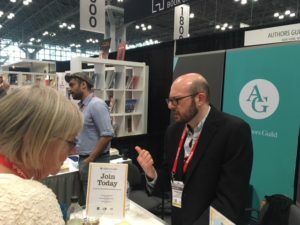 In addition to the Big Five, scores of indie publishers had booths, representing niche markets for religious, ethnic, political and social issues, health and fitness, food and cooking, short fiction collections. 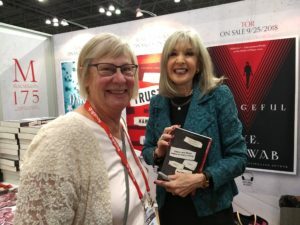 No matter what off-the-wall subject you imagine, chances are someone has published a book about it that shows up at BEA. 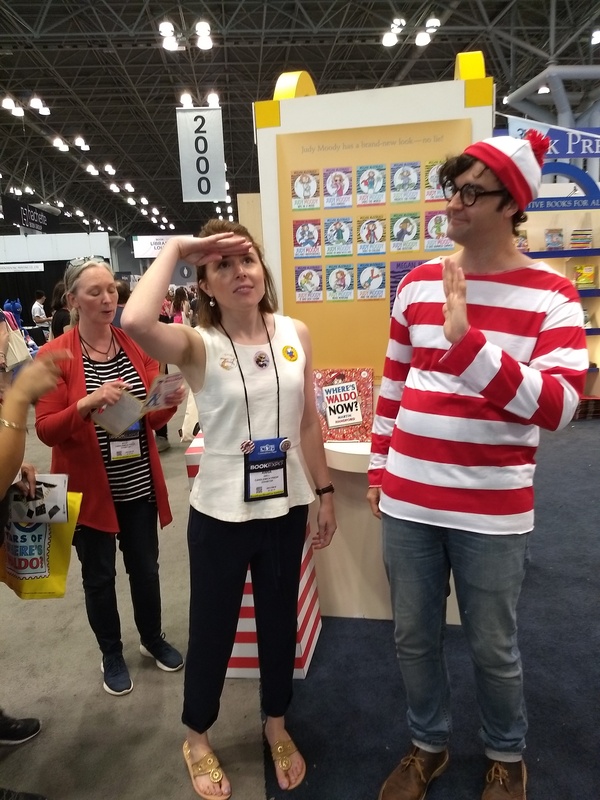 Children’s and YA book publishers were out in force, introducing thousands of new products: print books, graphic novels, puzzles, interactive 3D devices, plus tie-in merchandising like costumes, cuddly stuffed characters, sports equipment, etc. There were even quaint retro items like pens and stationary. Could writing actual letters be making a comeback? …and posed for photos dressed up as popular book characters. Older folks (like myself) often complain about young people zombie-walking through life with bent necks, mesmerized by their smartphones. 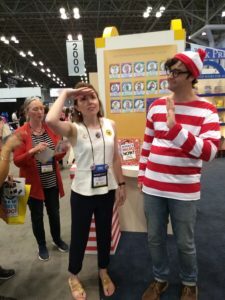 Yet at BookCon, I didn’t notice a single example of that disconnection. Kids engaged with each other and were excited about new adventures in reading. Witnessing that gave me hope. Audio book sales continue to grow by double digits, 30+% increase in the last year alone. A major BEA sponsor for 2018 was Blackstone Publishing. In 1987, the family-owned independent audio publisher started producing cassettes in a garage in Ashland, Oregon. They tapped into the town’s renowned Shakespeare Festival for narrating talent. Three decades later, Blackstone has expanded into a full-service publisher of print and e-books in addition to audio, employing more than 200 people. Still headquartered in Ashland, they’ve increased their presence in NYC with acquisitions editors, audio narrators, and a sound studio that’s second to none. Blackstone also showed me firsthand what a debut author’s dream launch should look like. Last April, I wrote about cadaver dogs and mentioned Susan Purvis’s upcoming memoir, Go Find, which Blackstone is publishing. At BEA, they rolled out the red carpet for Susan, including a 10-foot-tall banner at the entrance of the Javits Center. At their booth, lighted signs showcased new releases. Book covers were displayed on video screens. 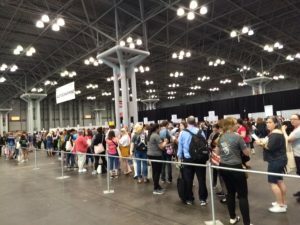 During signings, representatives guided people through the waiting line, graciously giving out swag including postcards, book bags, and ARCs. This contrasted sharply with some author signings sponsored by bigger houses where I wondered if cattle prods might be in use! Blackstone’s good treatment of authors has resulted in them picking up bestsellers like Orson Scott Card, cozy queen M.C. Beaton, and mother-daughter fantasy writers P.C. Cast and Kristin Cast. Despite BEA’s gargantuan scope, it offered opportunities to make personal contacts. A couple of hours into the first morning, I sank down at a vacant table, already exhausted, eyes glazing over. A woman with a similar dazed expression sat across from me and we commiserated about feeling overwhelmed. Her name was Bee Kapitan, a designer from Vancouver. She had just received an Independent Publisher Award for her interactive e-book How To Say Cheese. I showed her the proposed cover for my new book, Stalking Midas, and she graciously made suggestions. She introduced me to the burgeoning world of interactive book design. We’ll be keeping in touch. Another valuable connection occurred with the Authors Guild. I knew of their excellent advocacy for writers but hadn’t gotten around to joining. At their booth, I talked with staff attorney Umair Kazi and digital services coordinator Francesco Grisanzio about rights reversion. Their guidance helped me make a career decision I’d been putting off. Needless to say, after their assistance, I signed up to become a member. Another service they offer to authors is contract review. Before you sign a publishing contract, AG attorneys will review it and clarify the Byzantine maze of legalese. That alone is worth the $125 annual dues. Authors Guild has also forged a communication channel into Amazon to register author complaints. Hopefully AG’s advocacy will temper Amazon’s review policies that, to authors, often appear capricious and arbitrary. BEA gave me amazing insight into the publishing business. If I included all the adventures and interesting people I met in the Big Apple, this post would run into next week! I’ll stop now and turn it over to TKZers for questions and comments. A final post script: on the trip home I was privileged to meet a 91-year-old Holocaust survivor. That story is too long to add here but it can be found on my blog.